Private Eye Video Slot Review - Casino Answers! 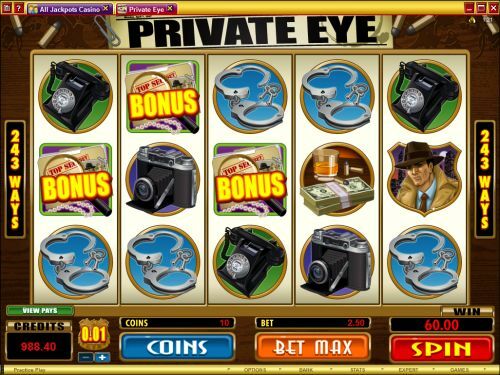 Private Eye is a 5-reel, 243-way video slot developed by Microgaming, featuring a wild symbol, scatter wins, multipliers, a free spins feature and two bonus games. You can play the Private Eye 243-way video slot at Bovada. Coin sizes on the Private Eye slot machine are $0.01, $0.02, $0.05, $0.10, $0.20 and $0.25. You can bet from 1-10 coins on the Private Eye slot game. You can bet anywhere from a quarter per spin up to the maximum total spin of $62.50 per spin. Private Eye has a decent betting range that is ideal for most online slots players. You can use the skill stop feature to manually put a halt to the reels at any time during a spin. To play the Private Eye online slot, select your bet and press the “Spin” button or use the “Bet Max” button. The Badge symbol is the highest paying symbol on the Private Eye video slot. If you land 5 of a Kind, you will win the 1000 coin top jackpot. The Badge symbol is also Private Eye’s wild symbol. The wild symbol will substitute for all symbols except for the scatter, bonus and free spins symbols. The scatter symbol is the Detective symbol. You can receive a scatter payout by landing 3 or more scatter symbols. 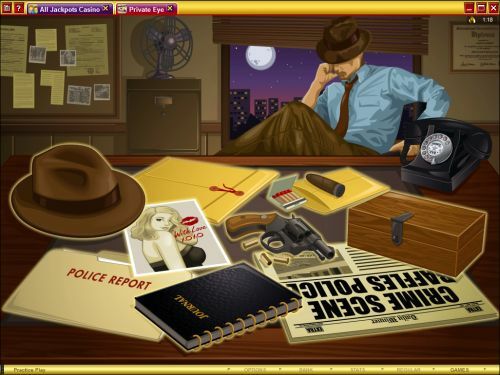 You can win up to 100X your total bet when 5 Detective scatter symbols appear on the reels. When the Newspaper Boy symbol appears on reels 3, 4 and 4, you will be able to choose three picks of newspapers to win up to 20 free spins at a 4X multiplier plus a cash prize (one for free spins, one for a multiplier and one for an extra win). All bets played are the same as the game that started the free spins feature. The free spins feature cannot be re-triggered. You can win up to 100,000 coins on the Private Eye free spins feature at Bovada! Way wins pay according to the Paytable and are multiplied by the coins bet. All wins pay left to right, except for scatter wins (which pay any). Way wins are awarded for adjacent symbol combinations. Scatter wins pay in any position. Scatter wins are multiplied by total bet. Scatter wins are added to way wins. To use the autoplay mode on the Private Eye online slot machine, you must hit the “Expert” button. You can now play 5 or 10 autoplay spins. For advanced settings, hit the “AutoPlay” button and you can now play 5, 10, 25, 50, 100, 250 or 500 autoplay spins and stop autoplay if a win exceeds or equals $100, $500, $1000, $5000 or $9999. Autoplay will stop on any feature contained in the game. You can stop autoplay at any time. With Private Eye, Microgaming has delivered another excellent 243-way video slot that seem to get better with every single one that they release. Private Eye has two great bonus features, an excellent free spins feature and a top-notch theme. You can play the Private Eye video slot when you sign up and deposit at Microgaming casinos such as Bovada! Where can I read more about 243-way video slots? If you want to learn more about 243-way video slots or you want to read more 243-way video slot reviews, please read our list of all ways video slots. Can I play the Private Eye video slot if I am located in the United States? Unfortunately, USA-based casino players cannot play the Private Eye video slot for real money at this time. Please check out Bovada for a great selection for USA-friendly video slots.